"Daria!" was the season premiere episode of the third season of the Daria TV series. It is sometimes called "Daria! The Musical." Despite its first air date, it had originally been intended to have this episode air in the middle of the season, so its episode number is 307. It first aired on MTV on February 17, 1999 and was written by Glenn Eichler and Peter Elwell. The day starts in Lawndale! At the Morgendorffers, the family gets up to start another day, full of optimism and joy for the beautiful day ("Morning in the Burbs"). Even the announcement of a possible hurricane in Lawndale does not get their spirits down. 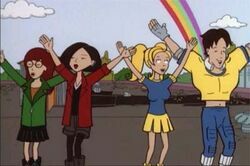 At Lawndale High, during lunchtime, Brittany mentions in passing that it is Pep rally day, prompting Daria and Jane to make plans to spend the afternoon at the roof. During the pep rally, however, Ms. Li anxiously informs the staff and students present that the hurricane is confirmed and heading in their direction: the game is cancelled and all must go home. Students and staff leave the school wondering how Lawndale and their lives could be affected by the storm ("If the Town Blows Away"). At the roof, Daria reads the news of the coming of the hurricane in the newspaper and she and Jane also speculate on the consequences of its passing ("If the Town Blows Away"). On their way out they meet Kevin and Brittany, who had sneak out of the gym to make out. After convincing both that the hurricane is real, they get stuck on the roof when Kevin inadvertently lets the stairs door close. They then lament over the fact that they are probably going to die ("If the Town Blows Away"). Meanwhile, more places in Lawndale are preparing for the Hurricane. In Helen's law firm, Marianne and Eric quickly leave, but Helen stays for some more moments, commenting to herself that she loves to work ("Don't They Know I Can't Leave Yet", sang in duet with Quinn). At the same time, Cashman's is closing, prompting a despondent Quinn to lament over the fact she can't get her perfect dresses that day ("Don't They Know I Can't Leave Yet", sang in duet with Helen). 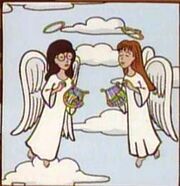 Jake's song imagines Daria and Quinn "joinin' that heavenly choir!" Jake is also coming home, driving and trying to call his house. The despair over the lack of answer and the traffic makes him drive recklessly and hope that both his daughters are safe ("Gah, Gah, Dammit!"). When he arrives, he finds Quinn and Helen preparing for the hurricane. As none of them knows Daria's whereabouts, they call the Lane's and Helen insists for Trent to come and stay with them for the storm's duration. Daria, for her part, is still struck at the school roof with Jane, Brittany and Kevin. For lack of a better option, they decide to hide in a small shack on the roof. While inside, all think and sing about their respective families and how they must be worrying about them ("They Must be Worried"). At the Morgendorffer's, Trent has arrived and all are enjoying some cocoa. Jake laments his usefulness over not being searching for Daria. As Helen intervenes, pointing that it's no use playing superman and going outside with the rain and wind, Jake snaps, saying that, in an emergency, a thought man is necessary ("Manly"). In a show of bravado, Jake and Trent leave to search for Daria and Jane. Unfortunately, they quickly crash the car. "The big wet rainstorm's overrrr!" Meanwhile, the shack on the school roof is slowly falling apart, so the four inside decide to leave before it breaks down completely. As the door is stuck, Kevin strikes it down, prompted by Brittany, Daria and Jane ("Manly"). When they leave the shack, lo and behold: the storm has passed and a clear sky with a rainbow greets them! The four sing and dance with the joy of having survived the hurricane ("The Big Wet Rainstorm's Over"), a song that is also sang by other of Lawndale's inhabitants: The Fashion Club, happy that they can shop once again; Mack and Jodie, depressed that Lawndale has stayed the same; the Trike Girl; Jake and Trent, who recuperate while Jake rants about the car accident. As Jake and Trent leave the car, they meet Daria and Jane (who presumably walked home). All greet and embrace each other enthusiastically and are soon joined by Helen and Quinn, also happy they are all right. Daria then breaks the fourth wall and comments to the audience the strangeness of the day and the hope another weird day will come. All Lawndale citizens then join them, singing about the next morning in Lawndale ("Morning in the Burbs"). MTV did an interview with the cast about this episode (see Links). Susie Lewis, co-producer, said they didn't know if the cast could sing but figured that it'd be funny if they couldn't. Daria's actors recorded their lines seperately and had them blended together in editing. To Glenn Eichler's surprise, they found Tracy Grandstaff and Wendy Hoopes' voices blended well together, even though they were singing seperately. Tracy Grandstaff called it her "favourite" episode because she's completely tone-deaf, and is fascinated "to this day" that they were able to talk her into doing it. She was instructed to bring Daria's energy down and flatten her voice more. Wendy Hoopes also enjoyed it, as she got to sing in three different voices. This episode is semi-controversial among some Daria fans as it is a musical and not a typical episode. 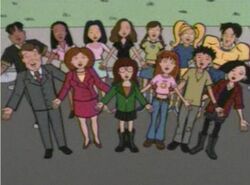 When word got out the third season premiere was to be a musical episode, some fans had an extremely negative reaction before they had even had a chance to see the episode, possibly because up until "Daria!" premiered the show was generally viewed as something firmly grounded in reality and not prone to frivolity or flights of fancy. In an April 2013 thread discussing the episode, Brother Grimace put forth a opinion that the episode should be considered as canon. He lists several reasons (including that the episode could be done just as easily without the musical elements, that the musical elements allow viewers insight into the characters' interior motivations not usually visible, and that other television programs have used musical episode in the exact same manner which are considered canon). A "Broadway" version of the theme song opened the episode during its TV broadcasts. The DVD boxset only used the opening titles for the first episode of every DVD, and so "Daria!" lacks this altered opening in the collection. To fit into hurricane season and when class is in session, this has to take place between early September to end of November. Surprisingly for Daria chronology, this fits really well: either you count this episode as the first of S3 (initial broadcast) and this is the start of Daria's third year in high school, or it comes after the October-set "Depth Takes a Holiday" and is in November. For the record, Jake's song in the car goes "gah-gah dammit", not "god-god". It's obvious they mean "god", but it wouldn't bode well for network censors. This episode features Trike Girl's most prominent role. She is seen riding her tricycle at both the beginning and end of the episode, leading some to ponder if she had been riding the entire time through the hurricane. There's a notable severe weather safety error on part of the Morgendorffers. Helen tells Trent to come over to their house, arguing for his safety. They all then proceed to weather to storm in the kitchen nook, right next to two large plate glass windows - the worst place to be during a hurricane, as any flying debris outside could shatter the widows, cutting everyone. Roof doors, like the one that locks Daria, Jane, Kevin and Brittany on the roof, in reality are designed to lock on the inside to prevent people from getting out on the roof in the first place, but not on the outside so that no one becomes trapped on the roof, as happened in this episode. However the door to the roof may have simply been in violation of building codes due to Ms. Li's paranoia. The voice singing "Manly" over the end credits sounds like the bragging guy Mystik Spiral met while in jail during Speedtrapped. Daria: ...who cares what jerk rejects us? In fanfic, fans tend to treat this episode as either a joke or a dream. In Driven Wild Universe Episode 20, "Memory Road," for instance, the characters treat the singing as a real event. Amy remarks, "This town bursts into song when the weather fluctuates." In "Not So Different," Sonny (a male version of Daria) reviews a journal entry about the storm. Author J-D says this was done specifically to leave ambiguity about whether or not the musical aspects actually happened. This page was last edited on 25 April 2018, at 12:25.